A wildfire is an unintentional fire occurring in an area of combustible vegetation such as a forest, grassland, prairie, or farmlands. Depending on the kind of vegetation, a wildfire can also be referred to as a bushfire, forest fire, woodland fire, grass fire, veld fire, or peat fire. Several studies have noted the ecological benefits of wildfires. However, the fact remains that these incidents have socioeconomic costs due to their negative impacts on properties and human lives. Understanding the causes of wildfire requires appreciating the notion that earth is fundamentally combustible due to the large coverage of carbon-rich vegetation, atmospheric oxygen, and natural events. 1. Dry Thunderstorm and Lightning: In the forested regions of the Pacific Northwest, lightning is the primary cause of wildfires. Researchers Miriam L. Rorig and Sue A. Ferguson explained that dry thunderstorm or heat storm produces thunder and lightning with minimal precipitation increases the risk of wildfires in a moisture-free ground environment. Positive lightning increases the likelihood of fire ignition. This type of lightning produces high peak currents and long continuing current that are capable of heating surfaces at higher temperature levels. 2. Climate and Weather Conditions: A dry and hot climate means that there is no moisture in the air and water on the ground, thus making vegetation and dead plants dryer. The condition either creates a conducive environment for sudden combustion or reinforces other more specific causes of wildfire such as lightning. Global warming due to climate change increases the likelihood of weather-induced wildfire. A study by John T. Abatzoglou and A. Park Williams concluded that climate change has already played a major role in the increased prevalence of wildfires in the United States. Their analysis of historical data further revealed that areas affected by forest fires in the U.S. had doubled in the last three decades. 3. Volcanic Eruption: Seismologic activities, particularly a volcanic eruption and the resulting flow of lava and pyroclastic materials are another natural cause of wildfires. Take note that lava and pyroclastic materials have a temperature ranging from 700 to 1200 degrees Celsius. Both lava flow and pyroclastic flow are capable of igniting most objects they touch. Expelled debris of molten rocks and pyroclastic materials are also hot enough to cause a fire. Hence, vegetation areas near an actively erupting volcano are almost always susceptible to wildfires. 4. Coal-Seam Fire: A coal-seam fire is a phenomenon involving the natural burning of an outcrop or underground coal seam. The geomorphological study of Claudia Kuenzer and Glenn B. Stracher explained that these fires ignite through spontaneous combustion, natural causes such as lightning, and human causes such as mining activities and arson. It also noted that these fires occur in China, the United States, India, South Africa, Russia, and elsewhere in the world with significant coal reserves. One of the effects of coal-seam fire is vegetation degradation. In some incidents, to be specific, coal-seam fire can result in a wildfire, especially if the coal deposits are under a flora such as forests and grasslands. In other instances, the process is reversed in which a wildfire or a fire occurring from the ground leads to a coal-seam fire. Several studies have concluded that human-started wildfires are disproportionately more common than naturally-occurring wildfires. The 2017 study of Jennifer K. Balch et al. 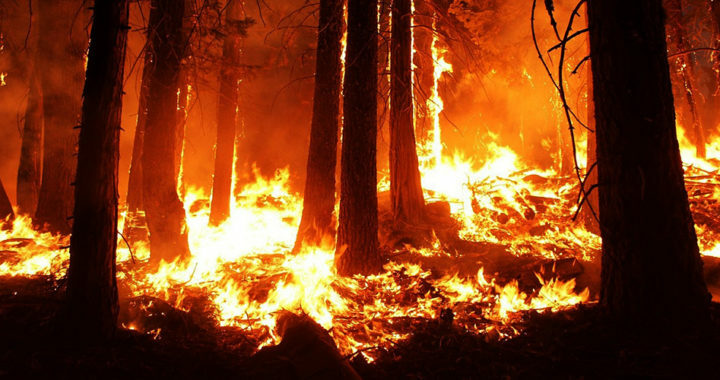 revealed that 84 percent of wildfires in the U.S. stemmed from human-induced factors. It also added that human-induced wildfires also occurred in areas where fuel moisture was higher, thus expanding the geographical and seasonal niche of wildfire incidents. Most notable direct human causes of wildfire include arson or intentional ignition, discarded cigarettes, power-line arcs, and sparks from equipment. When left uncontrolled or if the environment permits, slash-and-burn agriculture can also lead to a wildfire. There is also an interplay between the natural and human causes of wildfires. A persistently hot and dry weather condition creates a flora environment that is more susceptible to human-induced ignition. Deforestation or the development of forested or grassland areas can also result in a wildfire because they either leave combustible dead plants or encourage the growth of fire-conducive plants, thus making the environment susceptible to nature-induced combustions.